I run a research center called Centre for Technology Strategy at the Norwegian School of Management. 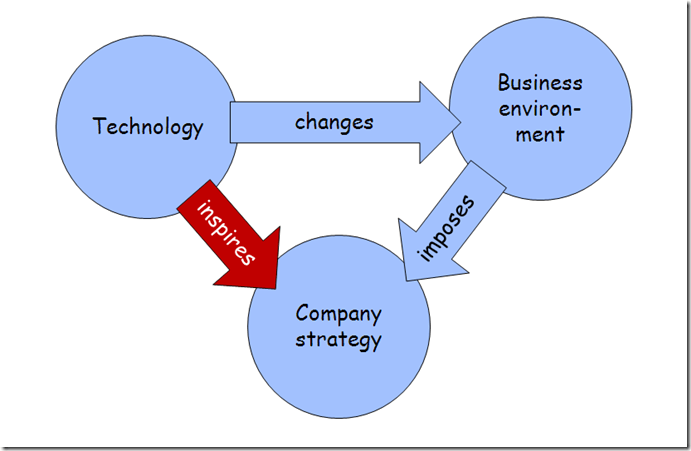 Inevitably, the question comes up – what is technology strategy? In my mind, the question is simple and comes down to two things: The realization that most changes in the world are due to changes in technology, and, hence, it is vitally important for managers to understand how technology evolves and how this evolution impacts their companies. In words: Technology drivers – i.e., changes in how we do things – changes the business environment, which again imposes changes in strategies on companies. Technology strategy aims to enable companies to understand the technology drivers to be able to change their strategies before they are forced to by the business environment. This is by no means easy. It may be hard to understand what the drivers are – if you were a producer of travel alarm clocks, would you have foreseen the use of cell phones as alarm clocks? And though the drivers may be easy to understand, you may under- or overestimate the time it takes before your business environment changes. Lastly, it may be easy to understand both the change and the timing, but just hard to deal with the change itself. Newspapers and book publishers, for instance, can easily see what is happening to the music industry, understand how the business environment is changing, yet find themselves repeating the errors of the music industry because the changes necessary goes against the norms and values of those of power, as well as their technology and their business model. To understand technology strategy, of course, you need also to understand the current business environment – in terms of the technology currently used – and how it shapes current strategy. And you need to have an understanding of technology evolution in general and the evolution of technology in your industry in particular. Lastly, you need an understanding of how to change technology inside organizations – something which requires an understanding of not just changing technology, but also organizational structures, incentive systems, and norms and values. This entry was posted in Academically speaking, iAD, Technology strategy, The thoughtful manager on September 28, 2009 by Espen. 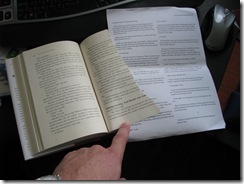 This time, I just found Cory’s full text on craphound.com and printed those pages out on my printer. Then I left them in the book. I saved time and kept the continuity, the bookseller saved time and money not having to exchange my book, and the publisher saved the cost of another copy. This entry was posted in Digital reflections, Nerdy ruminations, Reading on September 28, 2009 by Espen. Downstairs in a kind of cave is the kitchen, where an Army cook is baking square apple pies by the quarteracre. The floor is so deeply worn that he has to step over some of the high places. His coal stove is roaring, and he has arrived at that quiet hopelessness that cooks get on finally realizing that their work is never going to be finished, that there is no way of feeding a man once and for all. This entry was posted in History, Reading on September 27, 2009 by Espen. The seventh lecture will be in two parts. One is a discussion of IT economics, with an assignment to be handed in. The second is a guest lecture and discussion by a senior manager from Microsoft Norway. The relationship between information technology and economics – specifically productivity – is tricky. While most executives and all IT companies will agree that investing in information technology is a smart move, just how much you should invest and what the effect of the investment is is a bone of contention. 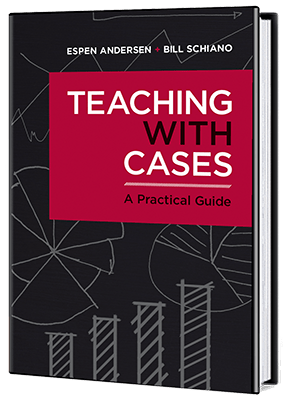 We will explore these questions through analyzing some data from a well known IT practitioner magazine, and compare what they say with the academic literature. Key here is an analytical assignment which is to be handed in before class. What are Hitt & Brynjolfsson’s three measures of information technology profitability — and their conclusions about them? How do you justify spending money on general technology, such as desktop computers and Internet bandwidth? How should you structure the spending? Imagine you are a CEO worrying about whether you are spending too much or not enough on information technology. How would the InformationWEEK 500 numbers help you? For the analysis, here is an Excel worksheet with the numbers. Download the file to your own computer, then analyze it there using Excel or any other software you would want. Note that the numbers and stories are from 1995, so focus on the numbers rather than the technical discussion (though you might note that the language, attitudes and numbers are not very different from what they would be today.) 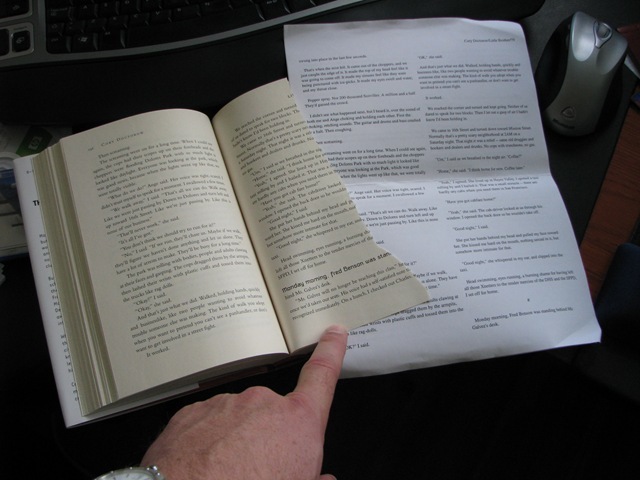 Also note that I will apply the two page maximum limit ruthlessly – that means two pages, nothing more, anything more than that will not even be looked at. Second part: Microsoft’s view of the future – a discussion with Petter Merok. 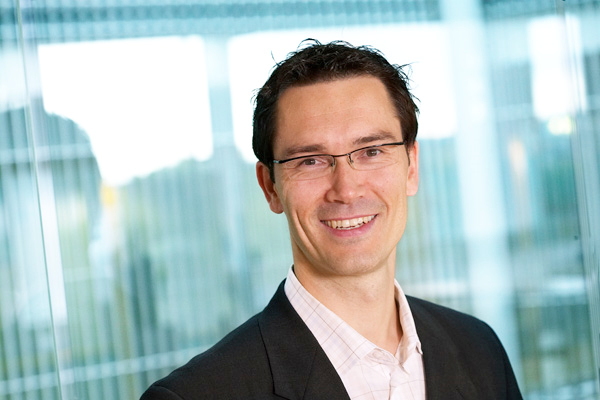 Petter Merok is Director of technology and responsible for business development at Microsoft Norway,. He is also central participant in many ongoing discussions about the future of technology use and development in Norway. He will lead an informal discussion about how Microsoft sees the future – both in business and technology terms. Romano, B.J. (2008). "Gates’ big-picture memos", Seattle Times. Gives an idea about changes in strategy in Microsoft, over time. Ray Ozzie, 2008: "Services Strategy Update". Another semi-internal memo giving important indications of Microsoft’s strategic direction. This entry was posted in GRA6821 on September 22, 2009 by Espen. Outsourcing becomes a more and more common way of providing administrative services, such as IT, HR, accounting and customer services (call centers). In this discussion, we will take a look at outsourcing as a phenomenon and try to understand some of the challenges and possibilities it offers, both for the company outsourcing the work and for the company taking it on. This great article from Wired (written by the indomitable Dan Pink) on various sides of outsourcing to India. Andersen, E. (2002). "Stamp Out Technology Virginity!" ACM Ubiquity 3(30). If you are going to pick just one person (or entity), who is responsible for the Manufact situation? Should John take Jim’s offer, and if so, on what terms? Why do organizations outsource? How has their intent changed over time? How does this change the outsourcing industry? Carl Christian Malm, Responsible for applications outsourcing at Accenture Norway, will give a presentation on Accenture’s work in outsourcing, focusing on the day-to-day details – how do you recognize customer demand, shape the contract, do the work, handle problems, and so on. Skewed wisdom of the crowds. Gotta work on becoming more equal than the rest of the crowd. Hilarious but somewhat depressing take on mid-life comparison angst. Gotta work on those options. Scalzi’s reaction to same. Gotta relax a bit. This entry was posted in Humor on September 22, 2009 by Espen.